Please support this very important campaign by making a donation. Please give whatever you can, every penny will be put to good use to help the animals caged in a nightmare world. Why are L'Oréal and other companies claiming to be cruelty-free when Naturewatch claims they are not? L'Oréal’s continued use of ‘innovative’ ingredients, tested on rabbits, mice and guinea pigs, led to Naturewatch announcing a boycott of L'Oréal in 2000. Since then Naturewatch has encouraged consumers to boycott L'Oréal products and the products of subsidiary companies which, disappointingly includes The Body Shop and more recently Urban Decay! June 2000 – Naturewatch launched Boycott to supporters informing them of the brand names of all the products made by L'Oréal and their subsidiary companies. Also the important fact that Nestlé are major shareholders in L'Oréal. July 2000 – Naturewatch requested a meeting with L’Oreal to discuss their continued use of animal-tested ingredients in their products. Despite several approaches by letter and telephone, the company refused to meet with us personally but suggested we set up a meeting with the CTPA. The Cosmetics, Toiletries & Perfumery Assocation is their industry lobbying body. November 2000 – Naturewatch organised a National Day of Protest against L’Oréal. Events were held at more than 28 locations around the country including outside L'Oréal (UK) HQ in London. March 2006 - L'Oréal announces takeover of The Body Shop! Supporters voiced their dismay with letters, phone calls, emails and protests outside Body Shop stores up and down the country. Naturewatch produced flyers and posters, encouraging the public to write to the Body Shop and to Boycott Body Shop products. March 2006 - Marketing magazine 'Brand Republic' announces that The Body Shop brand has slumped since the takeover by L'Oréal. June 2006 – We launched Body Shop Boycott at a protest outside Body Shop HQ in Sussex. The Peaceful Protest was widely reported in the media and was the lead story on BBC Southern TV. The protest also featured in prominent trade magazines. See images above. 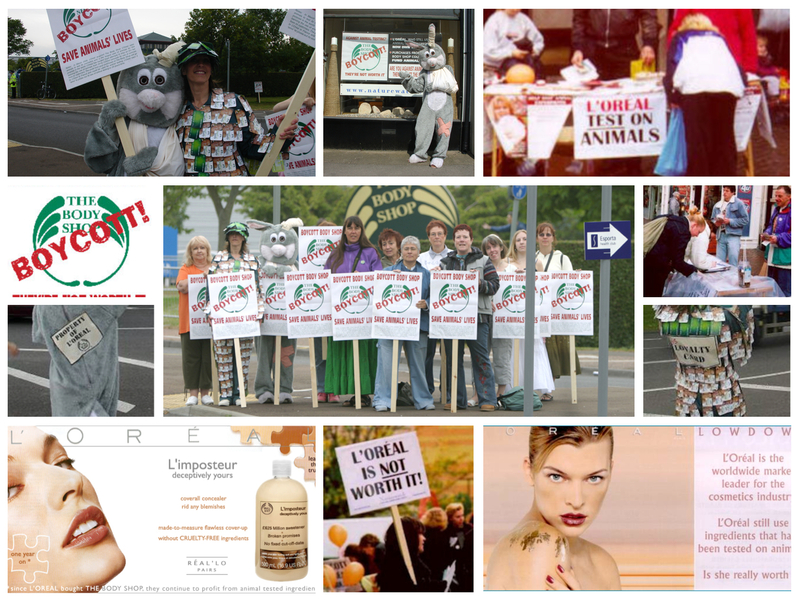 April 2007 – One year on protests continued to keep L'Oréal’s use of animal tested ingredients in the media spotlight around the world. For example, in Australia, members of Animal Liberation Victoria held a demonstration outside a Body Shop in Melbourne’s central business district. November 2017 – The Body Shop is sold by L’Oréal on the basis of dwindling profits. They are acquired by major Brazilian company, Natura. Naturewatch Foundation supporters called on Natura to reveal their full animal testing policy, eager to know if The Body Shop would now be genuinely cruelty-free from top to bottom. January 2018 – Naturewatch Foundation ends boycott of The Body Shop after pressure from our supporters compels Natura to announce a strong cruelty-free animal testing policy. Natura, and its subsidiary brands The Body Shop and Aesop are endorsed as cruelty-free brands by Naturewatch Foundation, but our campaign against L’Oréal continues. Boycott L'Oréal – They’re simply not worth it!